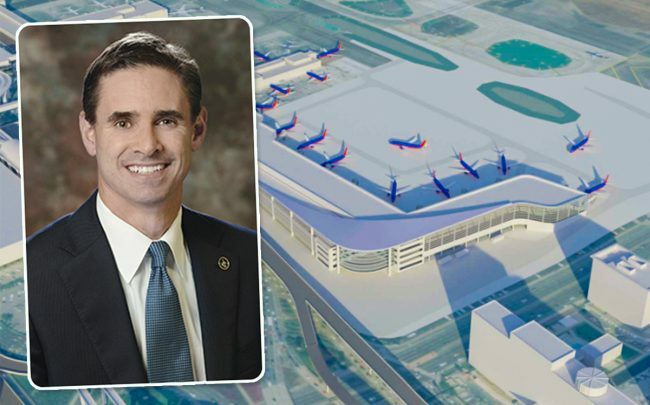 New details released as part of the massive expansion for Los Angeles International Airport show plans to build two terminals that would add up to 23 new domestic and international gates. The update came in a environmental report that described efforts to improve runway efficiency and safety and passenger traffic through the airport, according to the Los Angeles Times. That expansion is part of a $14 billion ongoing effort to drastically renovate the nation’s second busiest airport. Those include a highly anticipated $5 billion automated tram service dubbed the “People Mover,” which would connect Metro stations to traffic-choked airport. Roughly two years ago, city officials broke ground on the $1.6 billion Midfield Satellite Concourse, a 750,000-square-foot concourse at the international terminal with a dozen new gates. In October, the airport entered into a $2 billion contract with 11 companies to develop and operate a car rental facility there. It would consolidate 20 car rental operations spread around the area for a total of 5.3 million square feet.